November 24, 2015 - PENSACOLA, FLA - In the past 18 months, Smith Douglas Homes in Georgia has added Bath-Lite Series windows to 300 of their new homes. What keeps the builder coming back to the Hy-Lite privacy windows? Quality craftsmanship and design appeal. "The Bath-Lite Series offers our homebuyers privacy in the bathroom coupled with an aesthetically-pleasing appearance," says Geoff Shrewsbury, vice president trade relations/plan development for Smith Douglas Homes in Woodstock, Georgia. "These windows provide privacy while still allowing natural light into the bathroom. Plus, they eliminate the need for a blind on a clear glass window." Established in 2008, with more than 40 years of previous experience in the home building industry, Smith Douglas Homes is an award-winning home builder committed to building homes of value. "We build homes crafted for quality, built with integrity that will maintain enduring value for life," says Shrewsbury. "The classic silkscreened designs on the Bath-Lite windows we're currently installing --- and the Home Designer Collection windows we plan to offer in the near future --- are all products that help add value to our homes at an affordable price." Since 1954, LENNAR Homes has helped hundreds of thousands of families across America move into the next stage of their lives with a new home. And, during the past three years, those homebuyers moving into LENNAR Homes in the Raleigh area have found Hy-Lite privacy windows in their homes. "We install about 250 Hy-Lite acrylic block or decorative glass windows each year as upgrade options in our homes," says Jason Krear, LENNAR field verification manager. "These are mostly fixed units that go into the master bathroom to offer homeowners design style and privacy. "Homeowners seem to like the price point for these windows and their quality. 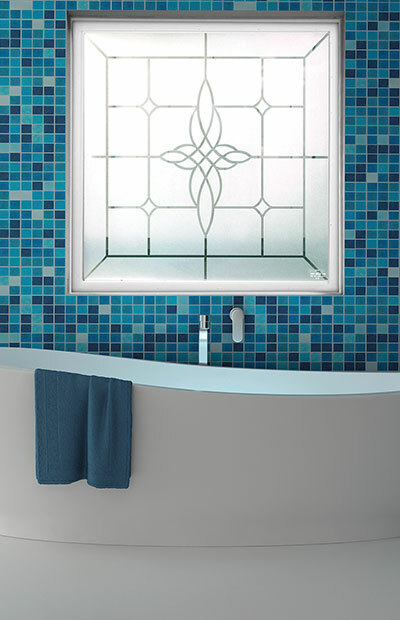 In the decorative glass window line, the leaded glass style appears to be a big design hit." Since 1988 Hy-Lite has grown its offering of privacy windows to include acrylic block, glass block, and decorative glass units that come in both fixed and operable styles. While many windows are used in bathroom settings, where privacy is most desired in the home, the windows can also be found in hallways, foyers, closets, kitchens and living areas of the home. The company's privacy product options include acrylic block shutters, accent panels, radius walls, partition walls, door inserts and shower walls. The Pensacola, Florida-based company is committed to providing residential and commercial construction professionals and homeowners with elegant, affordable privacy window designs. For more information, visit www.hy-lite.com.